From city halls to public agency front lines, governments are thinking more and more about how to create innovative solutions to their most pressing problems. This makes sense given the challenges governments face – dwindling budgets, increased citizen expectations, and morphing societal needs. But there’s something beyond that happening, too. City leaders are increasingly seeing innovation as a mindset and process to help solve challenging problems and improve the lives of the people they serve. And, increasingly, they realize it is an essential capability they wouldn’t want to govern without, reflected in the emergence of dedicated innovation officers, teams, and labs around the world. Bloomberg Philanthropies is funding innovation teams (i-teams) who help city leaders drive bold innovation, change culture, and create an ongoing ability to tackle big problems and deliver better results for residents. Mayors have effectively used i-teams on issues as diverse as murder reduction, economic development, and customer service. These teams cross the globe from the U.S. to Canada, Israel, and now, France. Through a recent partnership with La 27e Region, a French not-for profit public innovation organization, Bloomberg Philanthropies will bring its i-teams program to 10 local French governments to help them improve citizens’ lives. Innovation Teams is part of the American Cities Initiative, a suite of investments that empower cities to generate innovation and advance policy that moves the nation forward. Mayors and cities are uniquely positioned to drive bold solutions to complex challenges. Bloomberg Philanthropies initially tested the i-teams approach through a multi-year investment in five cities with great results. The mayors of all five pioneer cities saw the value of the i-team and invested public dollars to sustain them when the grants ended. Nearly 20 cities are now participating in the program, using dedicated i-teams to bring creative new approaches to their cities’ most pressing problems. Innovation-teams conduct deep qualitative and quantitative research and analyses to assess local conditions, develop innovative, responsive solutions, and relentlessly measure progress against clear goals. New Orleans has long held the unwelcome distinction of being the most murderous city in the country. Between 2008 and 2012, New Orleans had the highest murder rate of any United States city with a population greater than 250,000 people. In 2011, New Orleans’ murder rate was nearly 20% higher than that of the next highest city. Mayor Landrieu tasked his i-team with taking on this tough challenge. At the onset of their work, the i-team collaborated with the police department to conduct a rigorous analysis of the specific circumstances of each murder that occurred within the previous three years. This unprecedented deep dive using quantitative and qualitative data surfaced two key insights: 1) the majority of murders resulted from disputes among groups, and 2) a relatively small set of people were responsible for most acts of violence. Next, the i-team invited residents and other stakeholders in their city to help them better understand the problem and then develop and test solutions. This human-centered design approach integrated local young men from the community as co-creators of solutions to the problem. These community members were vital in helping the city understand the culture of their neighborhood, the motivation behind their actions, and ideas about the kinds of interventions that might be most effective in impacting the root of the problem. The result? A comprehensive murder reduction strategy, primarily focused on reducing group violence, that rolled out in May 2012. Since that time, the i-team has maintained a relentless focus on results, setting targets and using data and performance management to measure progress and impact. The i-team’s efforts have dramatically impacted the murder rate in New Orleans. Between 2011 and 2015, the rate dropped by 18%. No city in the United States has had a larger murder rate reduction from 2011 to 2015 than New Orleans (minimum population 250,000). Cities are uniquely able to innovate and transform citizens’ lives, but face many barriers to developing and implementing solutions to tough challenges. City governments are not always organized to support innovation, especially when it comes to addressing “horizontal” issues—such as poverty reduction, sustainability, or customer service—that are the shared responsibility of multiple departments and chains of command. The absence of standard management and engagement strategies to overcome department silos makes it harder for leaders to define, deliver, and sustain solutions to these complex and multifaceted challenges. Further, many mayors’ offices lack the human capital, organizational capacity, or financial resources to take on bold ideas. A tension exists between “putting out fires” and managing day-to-day responsibilities and finding the time and space needed to think, plan, and launch new solutions. There are few incentives within bureaucracies to experiment and try new things—but there are plenty of motivations to maintain the status quo or settle for incremental change. New programs that fail tend to attract more attention than those that succeed. And when it comes to innovation, there will inevitably be efforts that do not work as planned. The i-teams program was created to provide cities with a method to address these barriers and deliver change more effectively to their citizens. By using the most effective approaches to innovation, i-teams greatly reduce the risks associated with this work, and provide mayors with assurance in their ability to develop and implement effective solutions to their highest-priority problems. Boston’s population is expected to reach more than 700,000 residents by 2030. Mayor Walsh wants Boston to be a place that all residents can call home, but as the population grows, housing in Boston is becoming unaffordable for many, especially middle-income households. Mayor Walsh tasked his i-team with the challenge of lowering the cost to build, buy, and own middle-income housing in Boston. In collaboration with the Department of Neighborhood Development, Boston’s i-team applied a human-centered design approach that directly engaged the community to understand their housing needs and co-create solutions together. To do this they conducted ethnographic research with residents’ in their homes and gathered ideas from community members, housing advocates and policy experts. To develop solutions, the i-team had 300 meetings, participated in 25 community engagements, and discussed best practices with over 15 cities. The i-team is testing solutions, from micro-units to density bonuses, with the aim of increasing resident appetite for higher-density living. If successful, the i-team’s initiatives will be brought to scale, significantly contributing to the Mayor’s ambitious plan to make Boston a city with robust supply of affordable housing for middle-income households by 2018. Bloomberg Philanthropies began investing in i-teams in five cities in 2012. Today, nearly 20 cities around the world are participating in the program. What makes i-teams so powerful? They give city governments the ability to solve problems in a new way. Cities need a new discipline and corresponding to generate transformative ideas that produce real impact. By establishing dedicated i-teams, city leaders can create the space for staff to step away from their daily work and to rethink issues, reimagine outcomes, and capitalize on bold new possibilities. Ambitious: Mayors and city leaders use i-teams to bring creative new approaches to their cities’ most pressing problems. Innovation teams are uniquely positioned to make big changes on difficult problems that span departments. Human-Centered: Government solves problems faster and more creatively when it recognizes and relies on other people and ideas in their communities. Innovation teams share challenges and invite residents in their city to help define problems, then develop and test solutions. Risk Taking: Innovation teams challenge “business as usual” in their organizations. They test ideas with residents early on, before they are formalized, funded or vetted, in order to quickly gain feedback and improve their ideas so they can ultimately invest in the best solution. Versatile: Innovation teams seek to take on challenges across a wide spectrum of city issues. They transcend silos that normally exist, spend finite time solving a thorny issue, and are then redeployed by their mayors and city leaders to tackle the next big problem no one has yet been able to solve. In the past decade, Tel Aviv has seen a rapid increase in immigration, and nowhere is it more evident than in Neve Sha’anan, a neighborhood that is physically and socially isolated from the rest of the city. In 2006, it was majority Israeli, but today, 90% of residents are migrants fleeing conflict, mostly from Africa and Southeast Asia. Many lack legal status, meaning they cannot work legally, and grapple with over-crowding and a lack of vital services. Migrants and longtime residents of Neve Sha’anan live in mutual isolation: migrants are isolated from the rest of Tel Aviv, while Israeli residents feel isolated from their neighborhood and forgotten by the City. The i-team applied a human-centered design approach that directly engaged residents in the community to deeply understand their needs and get their help in creating solutions that worked, including 80 interviews with Israeli, Sudanese, and Eritrean residents. 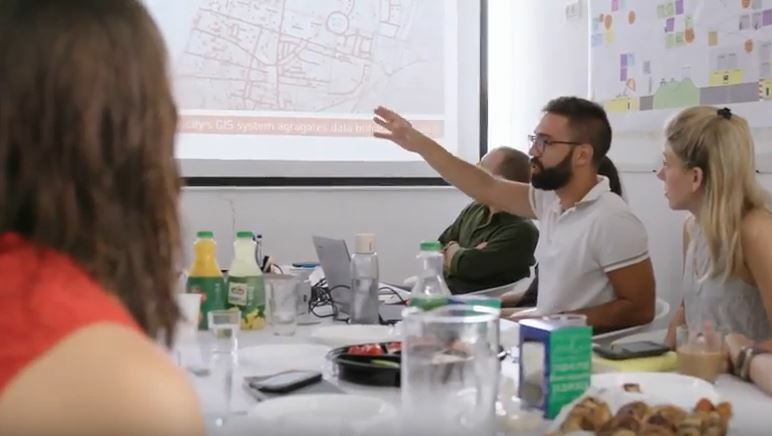 Informed by their research, the i-team has rolled out a portfolio of new initiatives to improve quality of life for residents of Neve Sh’anan, strengthen social cohesion, and better integrate the neighborhood into the life of the city. The i-team set out to transform the site of a derelict, crime-ridden bus station into a vibrant new hub for entrepreneurial organizations with a social mission in the neighborhood. Working with the Municipality, the i-team helped launch a new youth center with educational, cultural, and sports programming for kids as well as adults, services that are broadly available in most of Tel Aviv but were previously lacking in Neve Sha’anan. In addition, the i-team helped organize a series of monthly international food markets to build community inside the neighborhood and attract the broader Tel Aviv community outside the neighborhood by highlighting its multicultural identity and culinary offerings. Other initiatives aim to increase longtime Israeli residents’ sense of well-being to improve community cohesion, such as a program that matches elderly residents to young people who assist them with errands and help them get out into the neighborhood, providing a feeling of safety and companionship. The social entrepreneurship hub has supported dozens of businesses, and the site of the old bus station is now a lively and active public space. Meanwhile, the international food festivals have attracted over 20,000 visitors to the neighborhood—raising the profile of Neve Sha’anan and expanding business for migrant restaurant owners.